iDesign CustomVue iLASIK is specially designed to give you a sharper vision after your LASIK eye surgery. This procedure is also commonly referred to as “wavefront LASIK” or “custom LASIK” and helps make iLASIK surgery a more accurate and personalized eye surgery for the patient. In custom wavefront LASIK, a state-of- the-art wavefront technology is used for assessing the distinct characteristics of the patient’s eyes. So far, the LASIK corrections for nearly all types of prescriptions, whether involving contacts or glasses, have been almost the same. But in custom wavefront LASIK, the eye is measured from all angles using a uniquely designed laser. This laser makes use of “wavefront technology” for creating a 3-D visual of the patient’s eye. The data in the wavefront image allows the surgeon to customize the procedure to meet the specific needs of the patient. The traditional LASIK surgery is aimed at recreating the visual correction provided by your contacts or eyeglasses. However, an eyeglass prescription is not unique to an individual. 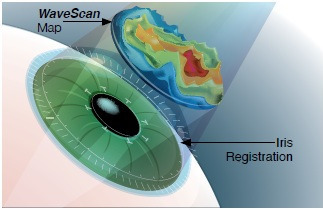 Custom wavefront LASIK was developed on the idea that each patient has unique eye characteristics which are difficult to measure with the standard available technology. People who wear the same prescription eyeglasses might have different levels of visual clarity as compared to those with the same lens prescriptions. The technology utilized in custom wavefront LASIK is transformational because it can enhance not just vision quantity, but also the vision quality, i.e. visual acuteness measured on factors such as fine vision and contrast sensitivity. A custom wavefront LASIK might lead to minimal risks of undesirable side effects after the LASIK surgery. These typically include night vision problems. Also, custom LASIK can treat lower as well as higher-level aberrations. Wavefront-guided LASIK is the most popular type of custom LASIK. In this procedure, the wavefront-produced comprehensive measurements of the light traveling through the eyes and falling on the retina are studied. This information helps in creating a treatment which is absolutely personalized for the patient’s specific eye anatomy. Besides correcting astigmatism, farsightedness and nearsightedness, the wavefront-guided LASIK is also helpful. in minimizing abnormal higher-level aberrations which could interfere with vision clarity even when all kinds of refractive errors have been corrected. The wavefront-guided LASIK is an FDA approved procedure in the United States. There are two other custom LASIK procedure options: ‘topography-guided LASIK’ and ‘’wavefront-optimized LASIK’.